One quote I have always loved and kept close to my heart is "Be a flamingo in a flock of pigeons." I absolutely love flamingos and imagining a flamingo eating seeds with pigeons brings the biggest grin to my face! Anyway, I personally have always stood out from the crowd, but I've always been judged and bullied for this for "not being the same as everyone else". I strongly believe in standing out and being different to everyone else and I believe all women should understand the beauty of embracing the way they are. There's a wonderful thing about the unique abilities each and every person has which make them so fabulous and this begins with yourself. You are unique and you are amazing for being different. Instead of spending all of your time trying to be someone you're not, you're spending your time being true to yourself. Doing the things you love, being who you want to be and expressing all the unique things about yourself. When you're not being true to yourself, you'll never fully develop as an individual and integrating with other people can become a struggle. If you spent your time being someone you truly weren't, you'll know the experience of stress from this! You can now spend your time relaxing and making time for yourself because it's a lot less hassle when you just be yourself and embrace your inner you. Trying to be someone else basically forms fake relationships, because your "Friends" only want to be your friends because you're doing what they want you to do. When you begin to embrace the real you, people will begin to love you for being different. You'll be the person who stands out in a crowd full of people and this will be a good thing! You're the only person in this world that looks like you, who acts like you and who has all the tiny little different features that not everyone notices. Being yourself and sharing these unique sparkles about you makes you attractive. My boyfriend prefers when I don't wear makeup and wear I don't make an effort because it's the part of me that's different compared to everyone else. I have dimples in my shoulders and I have moles in a line on my neck and these are things that are unique and no one else has them. It increases self-esteemWhen you realise that being yourself truly is enough to have everything you tried to get by being someone else, this is the discovery of your self-worth. There are people who want to be friends with you for who you are. There are those who admire you for who you are and this will increase your self-esteem by a crazy amount. Did you go through the craze of having ridiculous slug eyebrows to fit in? Or did you fake tan so much you turned orange? By being yourself, you won't experience these regrets. You won't be the same as everyone else and this is the best part of existing. When you make decisions based on what you want and feel will be best for you, these will be the decisions you least regret. It emphasises your storyOur bodies look different for many reasons: lifestyle, genetics, nature. But they all add up to the full picture of who you are. This is exactly the same with your personality, there are so many different aspects which make up your personality but the best part of it all, you'll always have the most amazing story because you're different. Do you have a lot of freckles which you try to hide? Or the one birth mark on your cheek which you think's embarrassing but your crush think it's cute? I do, I have moles underneath my mouth which look like spots. I also have them on my jaw line and down my neck. However, I don't try to hide them and you shouldn't either. We all have these little parts of us which are different to everyone else and we should embrace them instead of hiding them away with layers of concealer and foundation. 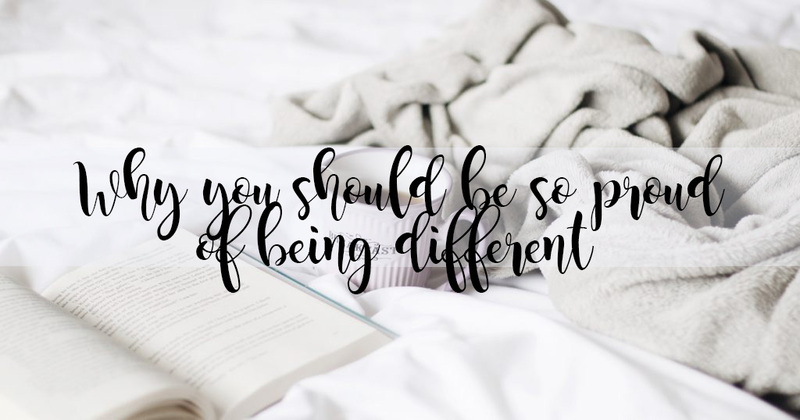 Being different and embracing this can make a completely difference to your life, and to be honest your future depends on being different, making a stand and being who you want to be. Focus on what you're doing, and not on what everyone else is doing. Thank you for reading and make sure to follow me on Bloglovin to keep up too date! I absolutely loved this, it was very inspiring and motivating! I used to "follow the crowd" when I was younger, yes I had the slug eyebrows and everything haha. Now I'm older I'm realizing more and more that I am my own person and I shouldn't care what other people think of me, I should do things for me, surround myself with positive people who won't judge me for who I am, and just overall live a more happier life! I love love love love this! Being yourself is the best thing you can be! Different doesn't mean bad. I think loads of people forget this. Loved this! Perfectly written. Your writing holds so much truth and inspiration. It's important to spread the message that women should embrace who they are and to be true to themselves. I'm sure you'll have motivated a lot of people today to be themselves. It's so important to be you, all the time and not follow trends! Love this post! Great post! I used to struggle to fit in everywhere, I never felt I truly embodied the labels, so eventually I gave up and let myself be myself, so much more fun! I love this post. It's so important and motivational.